It was in the Greek (Σοφíα) that Sophia came to denote wisdom. She (for wisdom, in the Greek, is always feminine) is mentioned by Plato, the Gnostics, and other Greek Ancients, as well as in our Scripture Wisdom literature. … so pure She pervades and permeates all things. the perfect mirror of God’s goodness. do not desert Her, She will keep you safe. 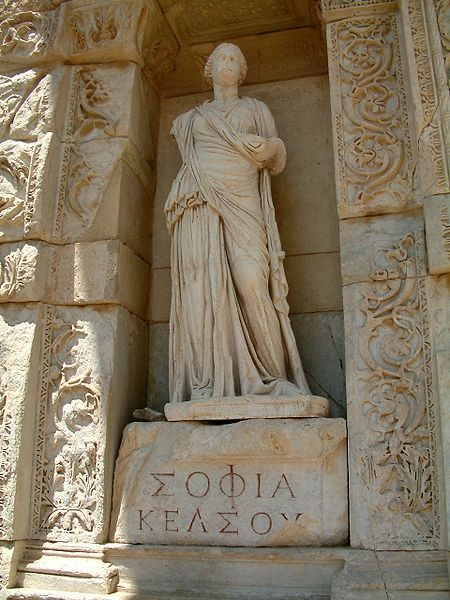 Personification of wisdom at the Celsus Library in Ephesus, Turkey.